Of course, we’re certain that there are some people out there itching at the opportunity of picking up the upcoming Nokia Lumia 710 when it officially becomes a part of T-Mobile’s lineup early next month, but for those who prefer checking out the Finnish company’s premium offering, they simply need to check out Amazon. Yes, the unlocked version of the Nokia Lumia 800 has been available for purchase since the beginning of the month, but for those who managed to resist the temptation of picking it up thus far, you’ll be glad that you decided to against your urges. Well, that’s because Amazon has slowly reduced the price of the Windows Phone Mango device by a mere $114.12. Of course, that might be perceived as little consolation – though, it’s better than the $649.99 pricing it was sporting initially. 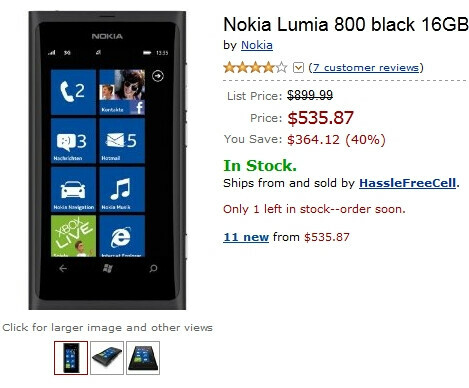 Therefore, if you can somehow sum up $535.87, you can place your order through Amazon for this highly prized and gorgeous looking Windows Phone. Naturally, free shipping is included with the purchase – so your main priority is to pay for the device and nothing more. On top of that, it’s an unlocked version that’s compatible to work with the various GSM networks littered around the world. 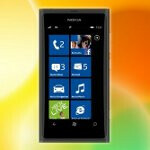 However, if you simply can’t foresee yourself ever spending that much on a handset, then it’s probably best to wait for the $49.99 Nokia Lumia 710 that T-Mobile will be getting – then again, it’s not quite a premium offering. Be sure to check the ussported frequencies before you buy. I belive this device only supports 1 of AT&T's 2 3G bands so you may get poorer reception in the US than elsewhere. In addition this will only had 2G data speeds at best on T-Mobile.